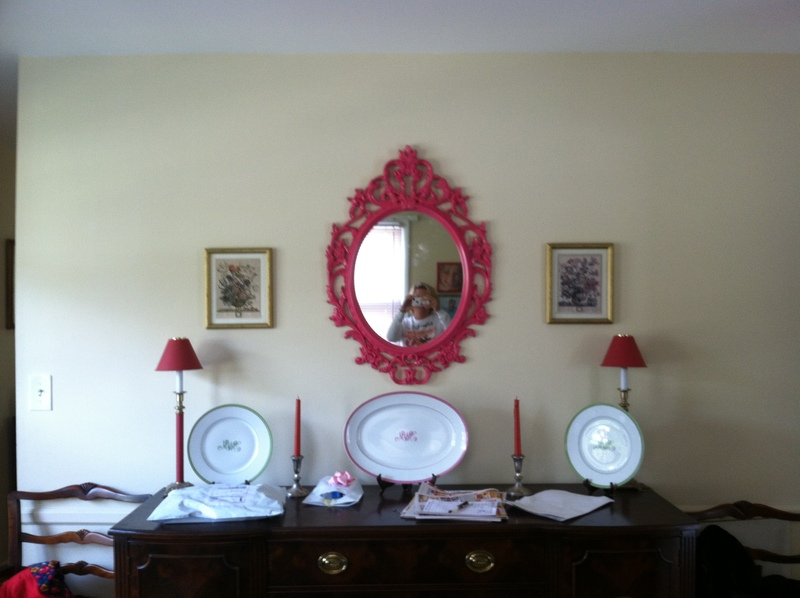 I spray painted the IKEA mirror and hung it in the dining room. It exceeded my expectations and looks awesome. 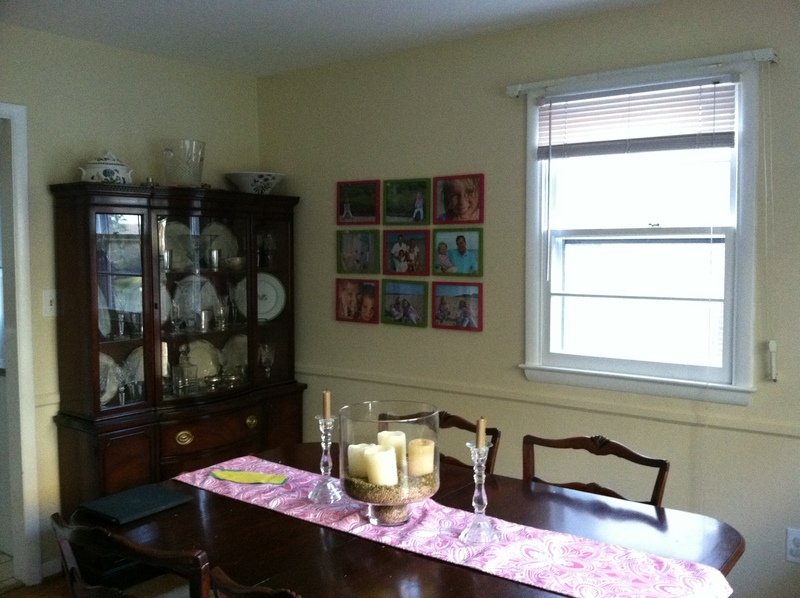 i’m on a tear now to complete the dining room makeover! 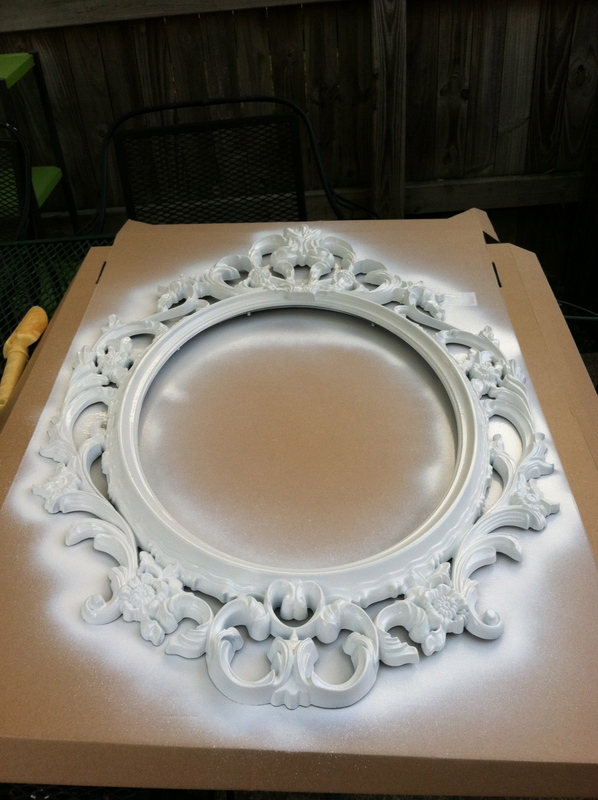 One coat of primer and one of the pink was all it took. I can thank Pinterest not only for my crafty indulgences but also for helping my shopping habit. This week someone posted a picture of adorable bright orange ballet flats with an $11.50 price tag! 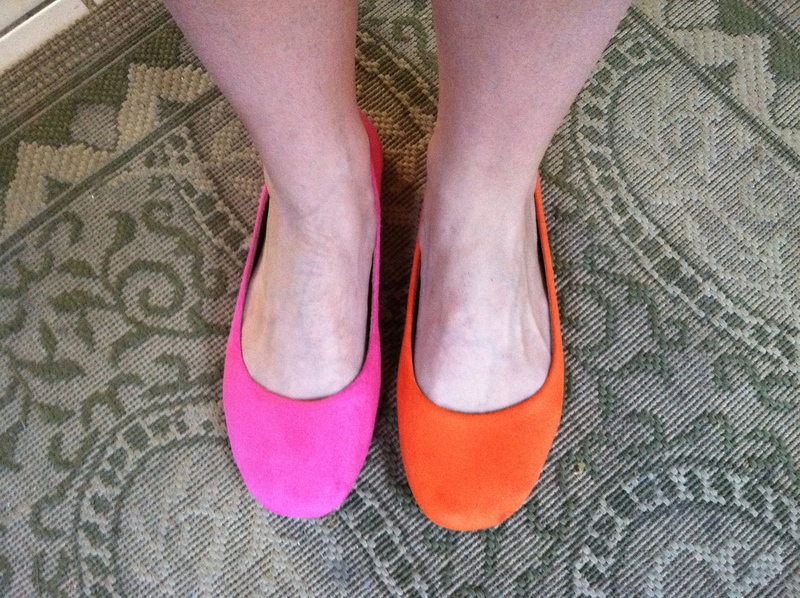 I had to check them out and once I did I felt compelled to purchase them in pink and orange. They arrived TODAY and are beyond precious! 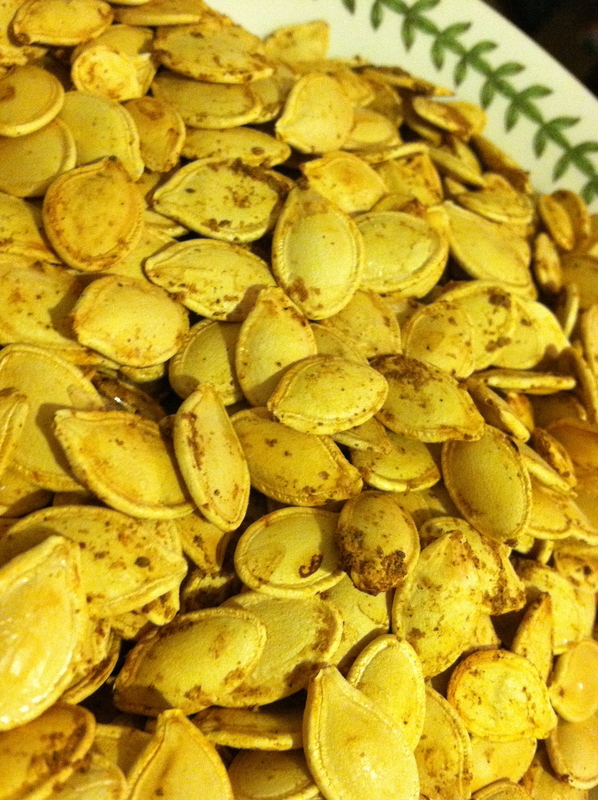 Cheaply made as the day is long, but who cares! They’ll look super cute with my navy blue dress tomorrow when my husband and I go out to dinner! I looked and looked and finally found a pattern for the girls Christmas dresses, the Precious Dress Pattern from the Scientific Seamstress. She also makes the tunic patterns that I’m eager to try and works with a fabric designer named Jennifer Paganelli, whose fabrics are right up my alley. And the BEST part, she’s local! I reached out to her to see if she would help me through any rough spots and she was sooo super duper kind and nice about it and said YES!!! I plan to adapt the dress a little for a surprise in the back (inspired of course, by a Pinterest post). So the next part of the dresses, was to find the fabric. I searched for HOURS on the interwebs and came up with lots of possibilities but not winners. And then I found Tanya Whalen and fell in love! I found one vendor who had enough of the fabrics that I wanted and ordered them earlier this week. They too arrived today! Take a peek! I can’t wait to get to work on them. 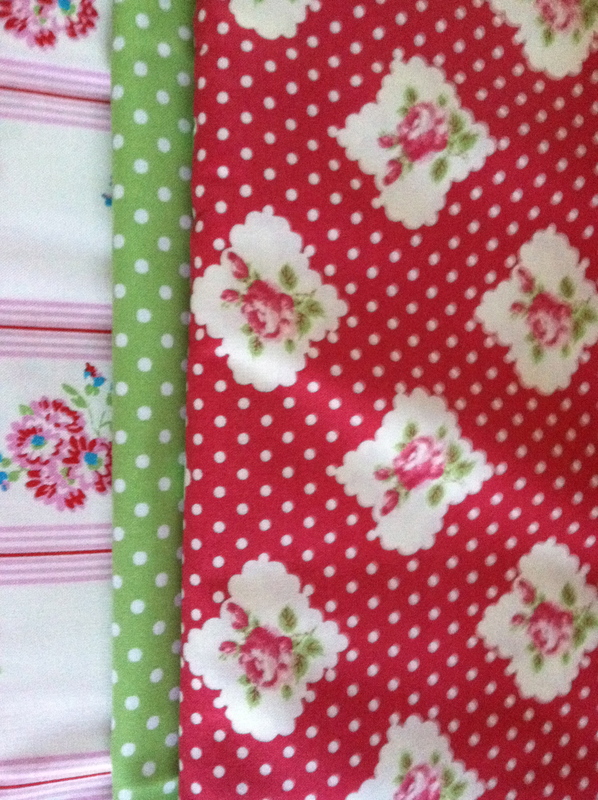 I plan to use the red as the main fabric and the other two as accent fabric. 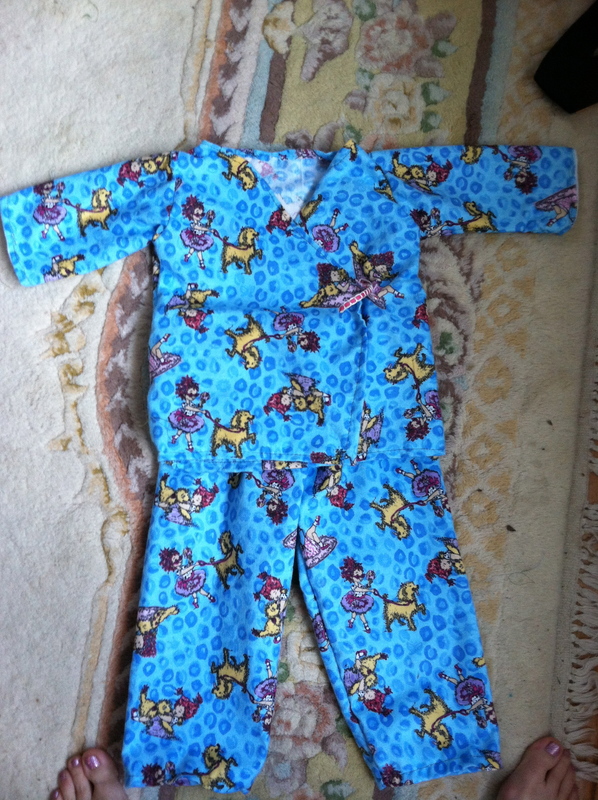 Since I got the dresses squared away I set to work finding just the right flannel to construct Christmas PJ’s for the girls, and since I was going to make them, I figured I’d make some for me and for Colin as well. When I asked him last night if He’d wear them Christmas morning, he was super excited about it! (Normally he gets all dressed before he comes downstairs so this is nice of him). 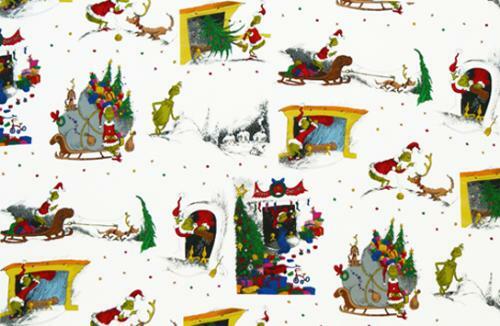 It’s tough to find a gender neutral fabric that is festive and fun that we’ll all like, but I settled on this Grinch fabric and Colin approved it. Finding enough yardage was a challenge, but the Cotton Blossom Farm on Etsy came through for me! I’m looking forward to starting these projects and am curious to see how I fair. With each I will have to learn to make buttonholes and I’d like to work on my finishing skills, a la a zig zag stitch and more pressing of the seams. I really like sewing and the fact that it makes me slow down and think about each step. It’s good for my lack of attention to detail. Makes me pay attention to the details a little more. Anyway that’s the sum of the week here at the White House. Hope you have a great weekend! 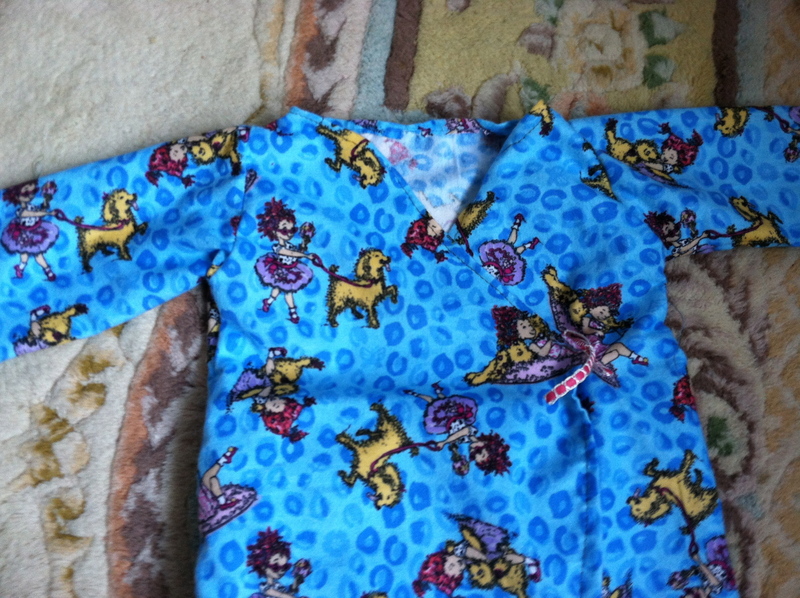 I sent the kids off to school this morning and was eager to sew up Lelia’s PJ’s. I had a little less than a yard of fabric for hers because it was the end of the bolt, so poor Lelia’s sleeves are 3/4 instead of full length, but I don’t think she’ll mind. Lots going on around here! 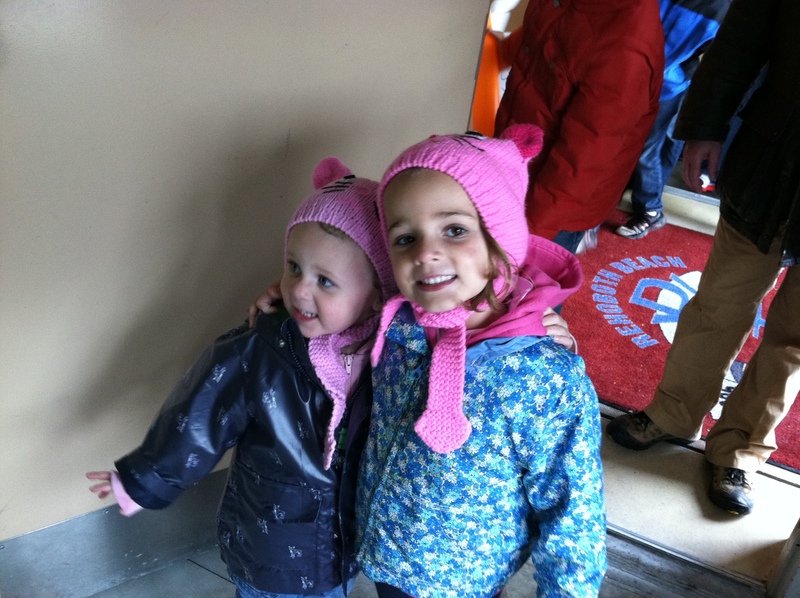 We spent the weekend in Rehoboth for the Sea Witch Festival, but most of it was canceled due to rain. So we came home early on Sunday. We ran into terrible traffic due to a downed power line on 50 and after spending 4+ hours in the car, everyone was anxious to do something! 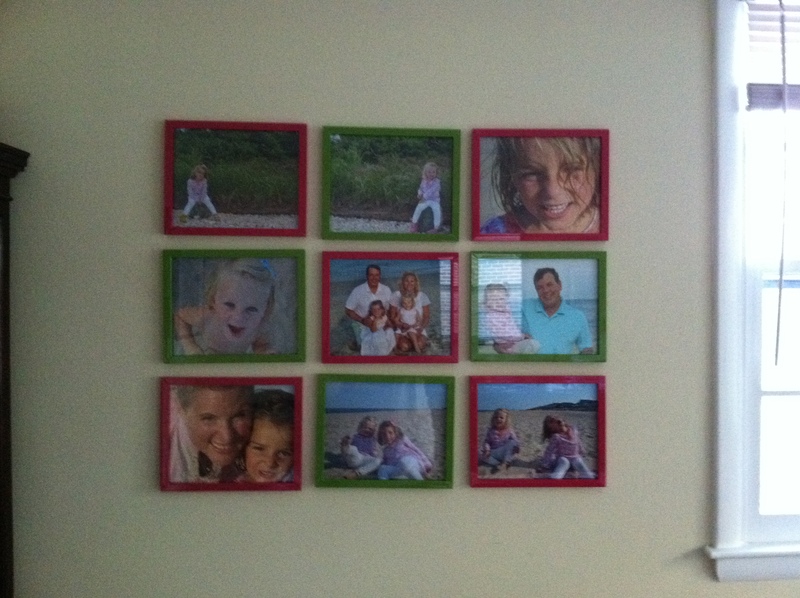 The girls played with the neighbors, and I got busy hanging the photos that we took at the beach this Summer. I found the frames on the cheap from target, they were $2.78 for a 2 pack! And then I ordered my prints from Shutterfly. I used blue painteres tape to mark out the spacing and then eyeballed it up from there, no measuring tape or level needed. It adds to the pink and green theme in the dining room and I’m quite pleased with how it turned out! Next up was pumpkin carving. 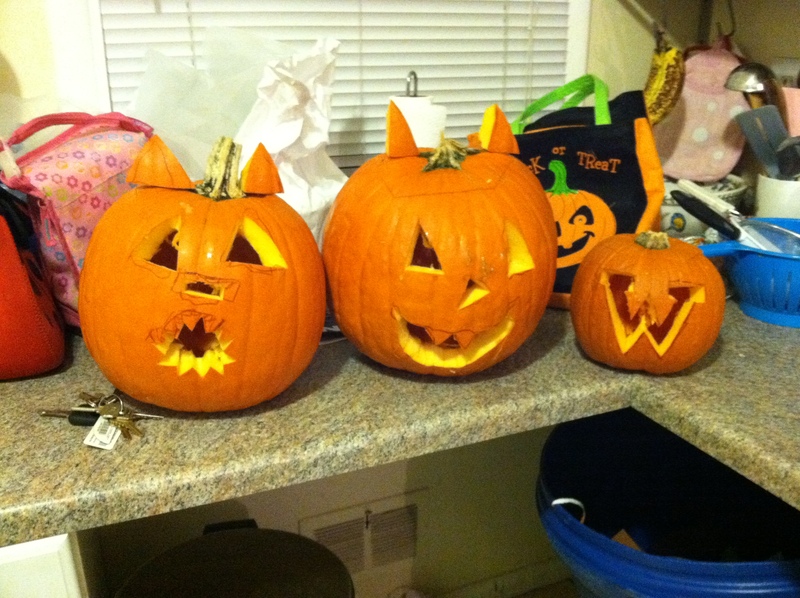 I let the girls draw the faces on their pumpkins (I assisted Lelia) and then I carved them out. Once they saw the triangle cutouts of the eyes, they asked to add them to the top as ears and transform their pumpkins in to cats, I think they were inspired by their cat hats from PappaDoc and Karen. What do you think? 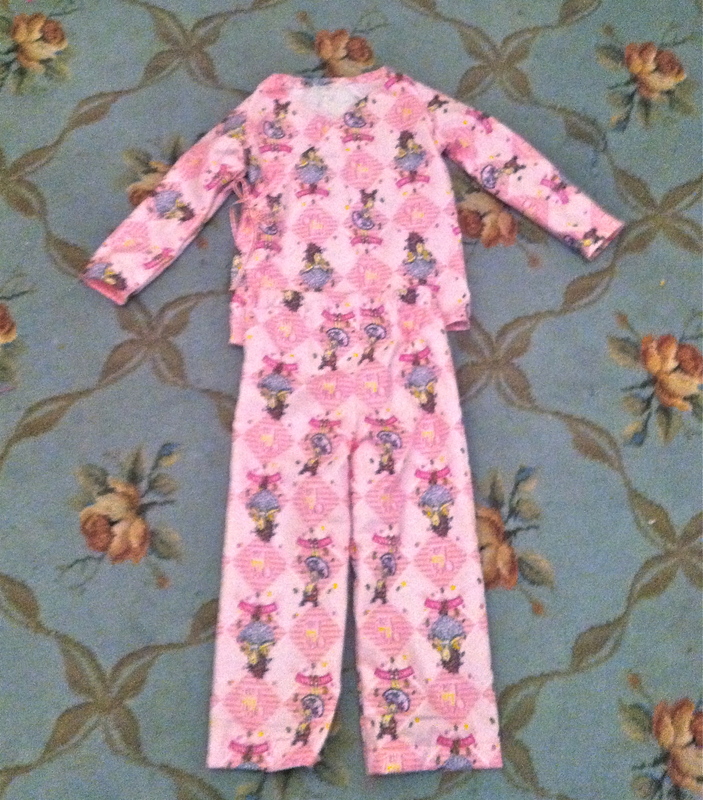 After the girlies went to bed I got to work on sewing my first set of PJ’s! I read this tutorial from Pinterest. Then I followed the same principle for the shirt, and referenced this pattern from Oliver & S. But didn’t follow a pattern, just made it up as I went along. Patterns scare me. 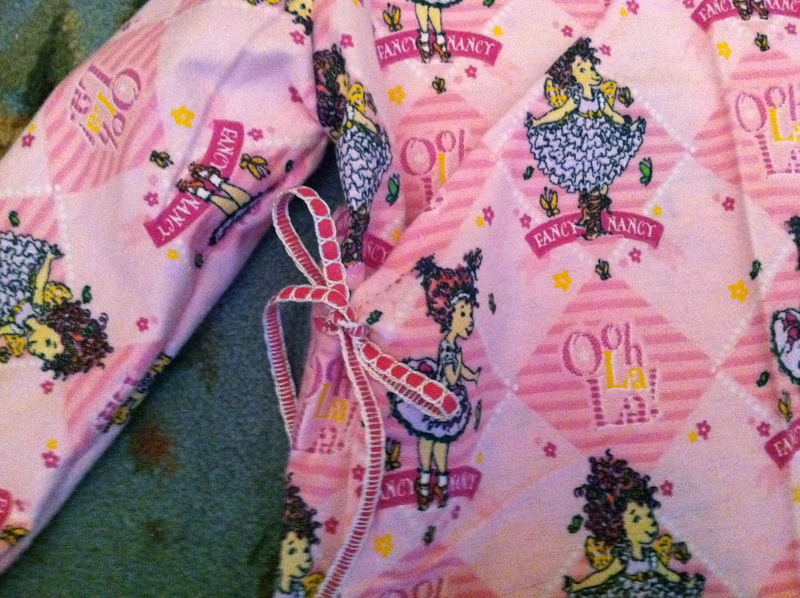 I used Fancy Nancy fabric b/c Iz loves Fancy Nancy, and of course, since my attention to detail is not great, I cut the legs out upside down. Oops. 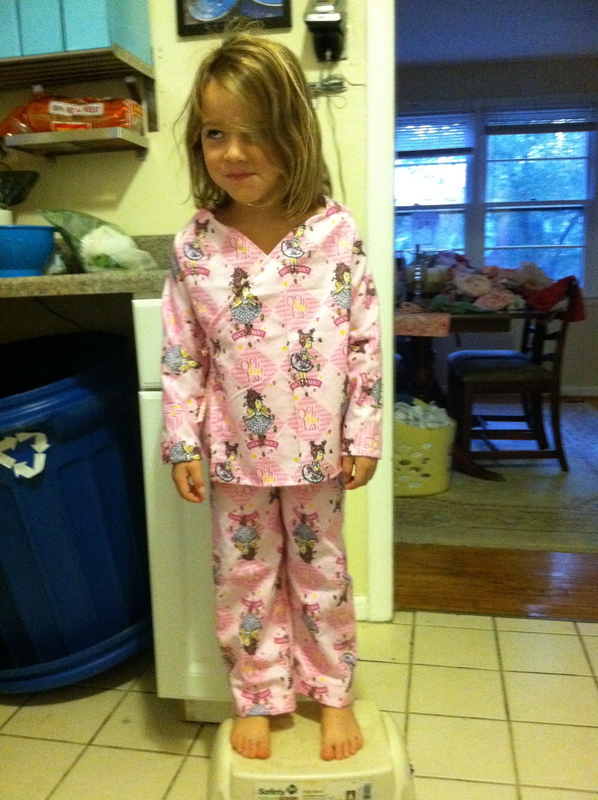 But Isabelle didn’t notice this morning and was quite happy with her PJ’s! 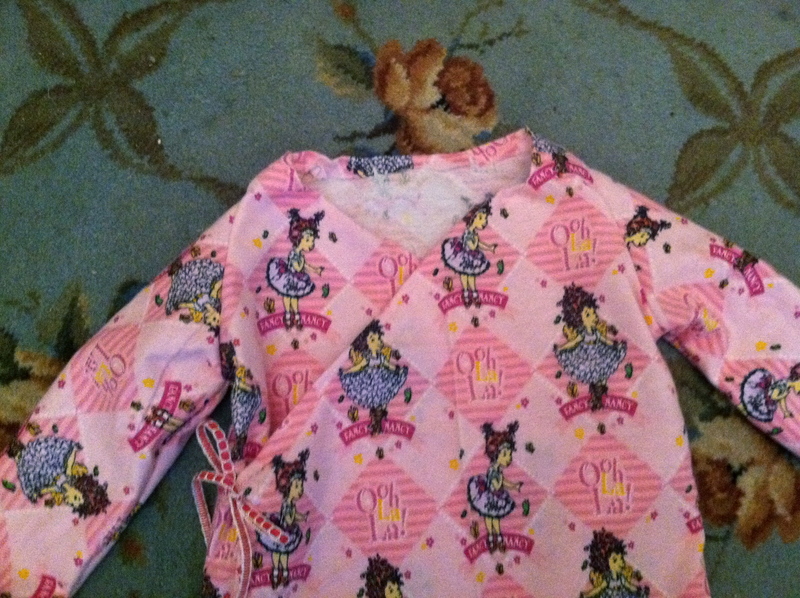 Today I will sew some for Lelia and I am FOR SURE going to be sewing their Christmas jammies this year! But I’m thinking about going with a night shirt instead.